Life without tea is unthinkable for the billions of people who rely on their cherished cuppas to get them through the day. But tea crops the world over are facing multiple threats, from climate change and water shortages to rural de-population and low wages. So serious are these threats, that some of the world's biggest tea companies are joining forces to combat them. Unilever, which owns Lipton, Brook Bond and PG Tips, Twinings, Finlays, and Tata Global Beverages, which owns Tetley, are laying to one side competitive instincts to protect the long-term future of their business and ensure that tea remains as accessible and affordable as it is today. "Unless we manage these issues, we're looking at a very different future for tea," says Sally Uren, chief executive of Forum for the Future, which is co-ordinating the Tea 2030 initiative. The threats to tea are many and varied. The world's population is set to grow by a third by 2050, increasing demand for food by up to 70%, according to the United Nations. And much of this population growth will be in rapidly-developing countries such as China and India - precisely those that produce the most tea. 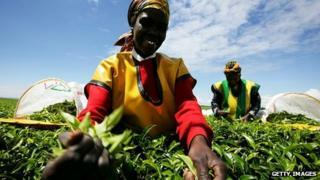 Pressure on agricultural land will inevitably rise, and tea will have to compete with other, more staple, crops. For example, between 2005 and 2010, 13,000 hectares of land in Indonesia was converted from tea to grow rubber, palm oil and fruit, while cashew nuts are becoming an increasingly attractive alternative in Sri Lanka. As Keith Writer, commodities director at Taylors of Harrogate, which is also part of the Tea 2030 initiative, says: "People have got more choices now about what crops they grow." In a world of limited resources and rapidly growing populations, tea may increasingly find itself crowded out. And it's not just growing populations, but demographics that will affect tea production. Urbanisation means rural workers are moving en masse to cities in search of higher wages and a better life. Traditionally, wages have been low in the tea industry, with many workers struggling to survive on less than a realistic living wage. The attraction of service-sector jobs in the city can be hard to resist. "Workers may be getting the right wage legally, but this may not be adequate. We need to look at what can be done to ensure workers receive a proper living wage," says Katy Tubb, director for tea at Tata Global Beverages. Climate change is another major threat to tea production. Tea is a relatively delicate plant, sensitive to changes in temperature and rainfall, and is grown in regions particularly vulnerable to extreme weather events. In the past 60 years, for example, rainfall has fallen significantly in Assam, the main tea-growing region of India, while forecasts suggest Sri Lanka will experience more intense rain and higher temperatures in the future. In those areas where rain can no longer be relied upon, tea growers have had to turn to irrigation, and with it the very real threat of water shortages. "It is quite possible that more extreme weather could interrupt supply and make tea far more difficult to grow," says Mr Writer. Tea production in some areas, particularly those at higher altitudes, will no longer be possible. The increasing popularity of tea in domestic markets also means there could be less available for export, so any shortfall in supply will be exacerbated in those countries dependent on imports to quench the massive demand for tea. Source: United Nations Food and Agriculture Organization. Production figures for 2012. "If production volumes drastically decline and domestic markets cut imports, then maybe the UK won't be able to get hold of reasonably priced tea. These are very real and visible threats," says Ms Uren. All these factors are already having an impact on supply and, therefore, price. From the 1970s through to the early 2000s, the price of tea fell gradually as supply exceeded demand. Since then, however, the price has more than doubled as the demand-supply dynamic has reversed, in no small part due to drought hitting global production. As Sarah Roberts, executive director at the Ethical Tea Partnership, says: "If tea production doesn't change, there are serious and substantial concerns about who is going to grow and pick tea." The scale and gravity of these threats has forced tea companies to work together. "The big players are realising the challenges they face are complex and too big to tackle alone. They are systemic and there are no easy answers," says Ms Uren. Much has been achieved already, as the tea industry has been collaborating for almost 20 years. For example, many companies have already achieved 100% Rainforest Alliance Certification, which reflects environmental as well as social standards. The focus has been on critical issues such as wages, irrigation, the role of women and educating farmers how best to grow and protect crops, and therefore their livelihoods. There is much more to do, but attention is also turning to longer-term, fundamental threats. "We all have an investment in the future of the tea industry, and we will have more impact, more scale and get things done faster and better [if we work together]," says Ms Tubb. Mr Writer says the tea companies have no choice. "We've got to work together, and if that means pooling resources - financial and expertise - then we must be open to it," she says. The tea industry is not alone - shipping companies have worked together successfully under the Sustainable Shipping Initiative - but increased collaboration is undoubtedly a sign of things to come. "We are taught in business school that competition is the driving force - it is the mantra. [Collaboration] is about re-wiring the corporate brain to understand that competition alone will not deliver a sustainable future", says Ms Uren. By working together, all parties seem hopeful there is enough time to resolve the grave threats facing the tea industry. Let's hope they're right, or one day drinking tea may be seen as more of a luxury than a necessity in the western world. Exactly as it was throughout much of history. Video Where does Britain's tea come from?